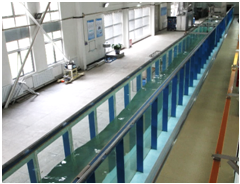 The large water flume and its affiliated synchronal sampling system is a multi-functional facility, which is primarily designed for modeling the complex wave/current-structure-seabed (flow-structure-soil) coupling processes.The majorframe of the flume is 52.0(m) in length, 1.0(m) in width and 1.5(m) in depth.Both periodic regular/random waves and steady unidirectional/reversing current can be generated concurrentlyor separately.The generated maximum wave height is 0.45(m), and the wave period is within the range of 0.5-5.0(s); the maximum flow velocity can be up to1.0(m/s). Tsunami-like solitary wave can also be simulated. 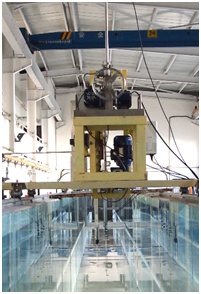 This flume possesses two test sections located at its middle: One is the soil-box equipped with a sand-raining device for sedimentation preparation, a piezecone testing equipment (CPTU) and an ultrasonic topography scanner; the other is for flow visualization by a specially designed upward-scanningsystem with Particle Image Velocimetry (PIV).Structural strains and displacements, and the excess pore pressure in the soil can be measured with Fiber Bragg Gratings (FBG) sensors, the Laster Displacement Transducers (LDTs) and the Pore Pressure Transducers (PPTs), respectively. Key signals for the flow, the structure and the underlying soil during the coupling processes can be real-time monitored and measured synchronously. 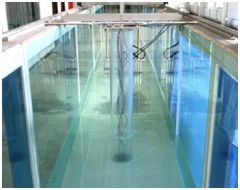 The facility can be employed for physical modeling wave-induced seabed liquefaction, scour around marine structures, offshore/coastal structure instability on the seabed, and flow-structure interactions, etc. Figure 1.Major frame of the flume(Top view). Figure 2.Test layout of local scour around a monopile.